A widower who is violent, unemployed and running out of money and a Christian woman who is suffering from terrible abuse from her husband form an unlikely friendship. Paddy Considine is one of those ever-reliable performers. With a wide array of parts in films ranging from the black revenge thriller, Dead Man’s Shoes, to the Hollywood blockbuster, The Bourne Ultimatum, to the Pegg and Frost police comedy, Hot Fuzz, Considine has turned his hand to every kind of role and has always had found success. Now, he has started to show us that he is equally unflappable as a director. Having won awards for his debut short, Dog Altogether, Considine has constructed a bitter-tasting, brutal drama for his first feature: a tale of domestic abuse which essentially asks what it is to be a good person. 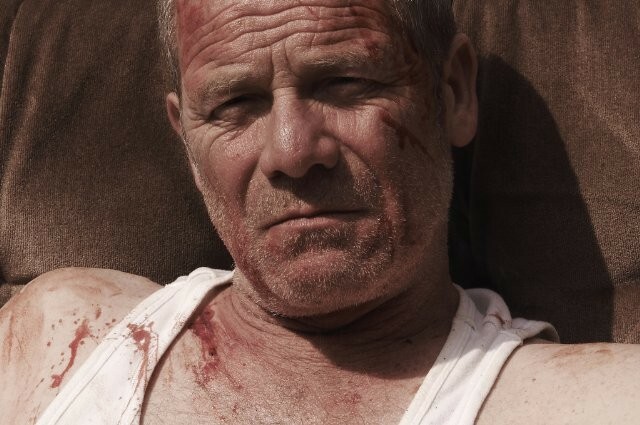 It focuses on a violent and angry man called Joseph (Peter Mullan) who is given to psychopathic outbursts of rageful violence. He has pushed everyone away from him, and at the beginning accidentally kills his dog in a moment of fury. At one point, he dives into a shop seemingly at random for a moment of peace. In the shop, he finds Hannah (Olivia Colman) who is seemingly a picture of Christian charity. An unquestionably good person, she has an abusive husband (Eddie Marsan) who is driving her to drink. Hannah and Joseph’s paths continue to cross, and these two very different people are drawn closer in their respective troubles. What follows is a harsh and brutal depiction of a marriage being torn apart by abuse, and it serves to shock in many ways. The film is as ambiguous as its characters are capricious. Their complexities challenge your assumptions and will you keep enthralled, but the film does not arrive at any clear conclusions about their nature. Perhaps therein lies the film’s only flaw: it is a transient look at two lives which, whilst engaging and affecting, maybe fails to provide real closure. However, other than its slightly subduing conclusions, this remains an incredibly tight and excellent piece of filmmaking. It is a grim ride which is deeply unpleasant to watch at some points. Whilst it is not aggressive in its nature, it does not hold back from depicting distressing events with fully terrifying conviction. On top of this, Considine gives his film a bleak look and feel. There is never any warmth in the colour palette and there is always a sense of impending doom. As such, the ninety-two minutes are not easy to get through, and, as if to illustrate this, the happiest scene takes place at a wake. Indeed, that moment shows off the subtlety of Considine’s direction. His style is unflashy, and even workmanlike, but highly effective. The wake is largely conducted without dialogue and it is one of several points where Considine’s excellent use of music takes control. The songs make the film soar, and the scenes where they take over are quite beautiful. Considine’s impressive debut is greatly assisted by the quality of his actors. Mullan is a grizzled, rasping, unpredictable presence who has a dangerous magnetism to him. Colman, meanwhile, is revelatory as Hannah in a perfectly judged turn, whilst there is an untypically nasty role for Marsan, who is quite typically excellent. The end result is harsh and honest story-telling, which certainly won’t be to everybody’s taste, but is most definitely excellent, made with the highest quality of acting by a high quality actor who has found that he has another string to his bow, which he really does know how to use.